I don’t usually write about restaurants because everybody else does, and usually, when I’m dining out, I want to be fully present with my dining companions and the food and don’t want to take photos and notes. I have to make an exception here because The Prospector Forno Rustica is pretty out-of-the-ordinary and has not received much press. I’m quite sure I would never know about this place if my family didn’t live in the Sierra Foothills near the town of Twain Harte, where The Prospector is located. Hell, most people I know have never heard of Twain Harte . Even if you visited Twain Harte and saw this restaurant, you’d likely pass it by, not knowing what a treasure you had just missed. Honestly, I’m not sure owner Robert Martin even cares. I get the feeling he likes operating what amounts to a sort of underground restaurant right out in the open. Though everything is strictly legal, I say underground because the place looks like a tourist pizza joint— a place where you take the kids for gloppy, cheesy, saucy, rubbery pizza after playing mini golf at the course next door. In fact, I’ve heard that kids aren’t even allowed in the restaurant and this is NOT kid pizza (though they'd like it too). 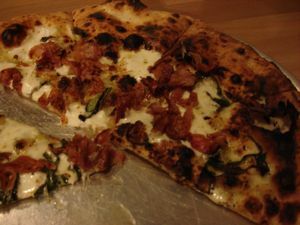 It’s honest-to-god certified Napoletana pizza from a wood-fired oven. It’s a quirky place. For starters, there’s no stove, so everything is made in the oven. So it’s really about the pizza. But the night we went there was a simple pasta on the menu—rolled out before our very eyes, boiled in a big pot in the oven and sautéed in a skillet on the edge of the oven’s hellishly hot maw. There may or may not be salad on the menu. There wasn’t any the night we went. It’s also about the wine. A large collection of retail priced foreign and domestic bottles. Honestly I was focused on the pizza and didn’t look into the wine at all, just poured myself a glass of something tasty and Italian from the bottles lined up on the counter. Wish I’d looked a little harder because judging from this interview with the owner in The Sierra Mountain Times, there are probably some well-priced treasures there, as a wine bar was really the original business plan. There’s no table service. You order at the counter, pour your own wine (the glasses are helpfully marked), get your own water, table settings etc. and then settle in to watch the pizza artists at work. The pizzas are brought out one at a time by the chefs. You’ll need to order 1 per person or try another menu item because they aren’t large. What can I say? The pizza was perfection. 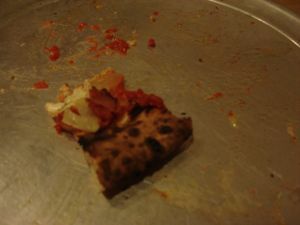 Crisp, thin, blistered crust with structure and chewiness. Great toppings, judiciously applied. Nice combinations. We had a white pizza with prosciutto, basil, and roasted onions, and a red one with spicy salami and fresh mozzarella (made in-house, I believe). We enjoyed a fresh pasta with mushrooms, olive oil, and Parmesan–simple and perfect. 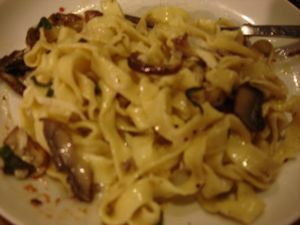 In fact, the first pasta was discarded as not good enough before it even made it to the table, and remade by the owner/chef. We watched him do it. Sorry about the bad photos. It was a little too dark. If you’re curious and you’re not about to make it to Twain Harte anytime soon, you can go to the Prospector pizza webcam (it’s usually running during dinner service) and watch the masters at work. Honestly though, it’s kind of like watching paint dry between orders, but fascinating, as there’s sort of a wild west Slow Food vibe going on there. Oh, and you can follow The Prospector on Twitter, naturally. This entry was posted in breads and pizzas, food news. Bookmark the permalink. Post a comment or leave a trackback: Trackback URL. Great serendipitous write-up, Vanessa! Loved the description, the place sounds like a real treasure, especially for folks who actually live out there. And to hear you rave about a pizza….well, that’s a dangerous lot as west of the Mississippi, much less the Rockies, there ain’t much to brag about! Thanks for the gracious commentary Vanessa! Let me know in advance when you are coming to the area so I can plan a special dinner item for you. You can follow our dinner menu items on facebook as we post them most everyday. Also we love kids,its really the parents of the unruly ones when discourage from coming however from June through Labor day on Friday and Saturday nights we have a no one under 21 policy to give reprieve to the many visiting parents in summertime Twain Harte. Thanks for stopping by Robert and commenting and also clarifying the child policy. I wasn’t sure what the deal was, which is why my comment was not definitive. I would have definitely checked with you before saying “no children are allowed.” I would love to come to one of the special dinners you do there. I think that what you’re doing in Twain Harte is wonderful. A true treasure for the community. I love The Prospector. I am so happy to see the buzz spreading through the Bay Area. We eat there whenever we are in Twain Harte. Great food, great wine, great company.